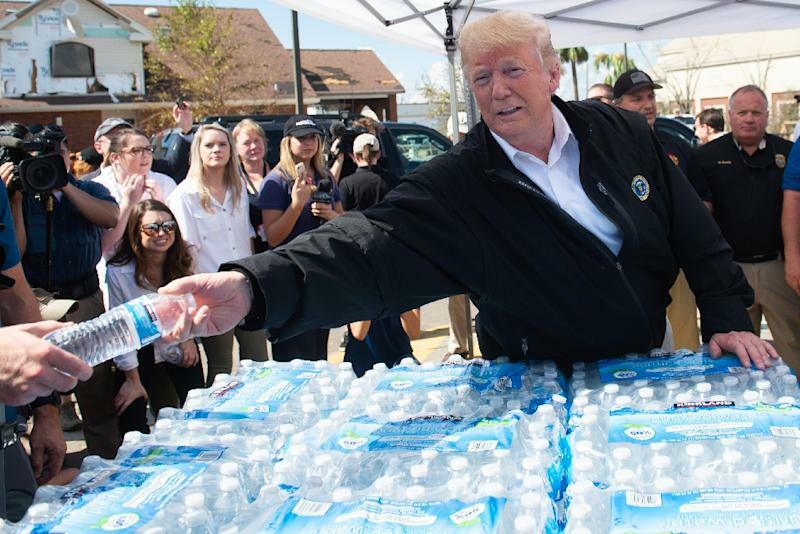 Panama City (United States) (AFP) - President Donald Trump on Monday met with victims of Hurricane Michael in devastated areas of Florida and Georgia but again cast doubt on the scientific consensus that climate change is caused by human activity. Flying in the Marine One presidential helicopter over Florida's Mexico Beach, one of the towns worst hit by the Category 4 storm, Trump surveyed uprooted trees and rows of roofless homes, some of them torn from their foundations. "It is incredible, the power of the storm," Trump said in televised remarks after witnessing downed water towers and a parking lot where 18-wheel trucks had been scattered like children's toys. "Somebody said it was like a very wide, extremely wide tornado. That's really what this was," he said. "This was beyond any winds that they've seen." Michael smashed into Florida's western coast last Wednesday, packing winds of 155 miles (250 kilometers) an hour as it began a northern march through several states, killing at least 18 people, according to US media reports. Trump was accompanied by his wife Melania , Florida's outgoing Republican governor Rick Scott and Kirstjen Nielsen, head of the Department of Homeland Security, as he inspected damaged homes and businesses. The president praised Scott, who is running for the Senate in next month's tense midterm elections, for "doing an incredible job." Trump, a longtime climate change skeptic, said he does believe the climate is shifting, but argued that any worsening may not be permanent, as well as questioning the overwhelming scientific agreement that global warming is caused by human activity. "There is something there, man-made or not. There is something there. 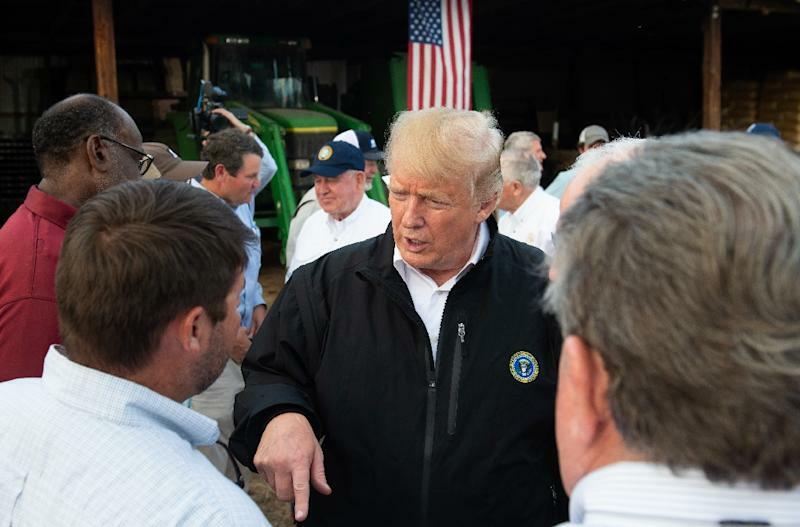 It is going to go back and forth," Trump said while visiting Georgia, which was also damaged by Hurricane Michael last week. "We have been hit by the weather, there is no question about it," he said. However, he noted that there had been violent hurricanes, causing widespread destruction, in the past. "The one that they say was worse, two or three (times) worse -- one was in the 1890s and one exactly 50 years ago. Winds were 200 miles (322 kilometers) an hour. Who knows? That's what the numbers are." Trump has previously openly dismissed claims -- backed by the vast majority of important scientific bodies -- that greenhouse gases caused by human activity are responsible for a rapidly warming planet, triggering ever more extreme weather. He has even dismissed international pushes to reduce greenhouse gases as a hoax invented by rival China to cripple US industrial might. 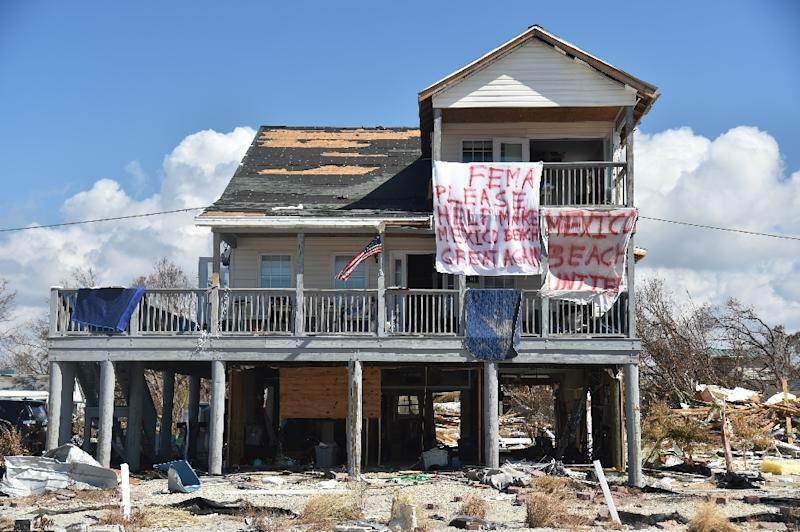 Florida's Panama City, along with the smaller resort of Mexico Beach, were left particularly devastated, with thousands of homes and businesses destroyed. "You wouldn't even know they had homes," Trump said of people whose houses were swept off their foundations as the monster storm hit. "Right now it's just survival," said Daniel Fraga, a resident of Panama City. "The good thing is we all came together, we all help each other. We are in this together." Tyndall Air Force Base, located between Panama City and Mexico Beach, suffered extensive damage and reports had speculated on the fate of a number of F-22 fighter jets that could not be flown out ahead of Michael's arrival. Each of the aircraft costs around $150 million, or more than $330 million when research and development are priced in. "Visually, they were all intact and looked much better than expected considering the surrounding damage to some structures," the Air Force said in a statement. "Our maintenance professionals will do a detailed assessment of the F-22 Raptors and other aircraft before we can say with certainty that damaged aircraft can be repaired and sent back into the skies." Trump's tour took him past the base before he took off in Air Force One for Georgia.